The best things in life are often the simplest ones. This is of course, also true for food. At friends’ Eliot and Rebecca’s last night, we had a great dessert composed of a winning combo: watermelon and fresh lime juice. Who Knew? Turns out, watermelon has been around a long time. Packed with Vitamin C and A, and some good B vitamins, evidence of this fruit and plant has turned up in the Nile Valley as long ago as the Second Millenium BCE. Science Daily reports that watermelon may have a viagra effect, which the Jerusalem Report covered last week (reportedly setting off an unprecedented surge in watermelon sales in a country that already appreciates the fruit for its other delights). Did you know that we are in the midst of “National Watermelon Month”? (Neither did I). Made up of 90% water, it’s no surprise that it’s a summer favorite and a favorite for those of us trying to shed a bit of our winter insulation. But have you tried it with lime??? According to the very trusted (!) Wikipedia entry on limes, the name for these little citrus fruits is derived from the Perian, “limu”, and was introduced to Europe during the Crusades. There are of course, many kinds of limes, but they are also a great source of Vitamin C, and have an “antibiotic” effect. In several villages in West Africa where cholera epidemics had occurred, the inclusion of lime juice during the main meal of the day was determined to have been protective against the contraction of cholera. (Cholera is a disease triggered by activity of the bacteria called Vibrio cholera). Researchers quickly began to experiment with the addition of lime juice to the sauce eaten with rice, and in this role, lime juice was also found to have a strong protective effect against cholera. 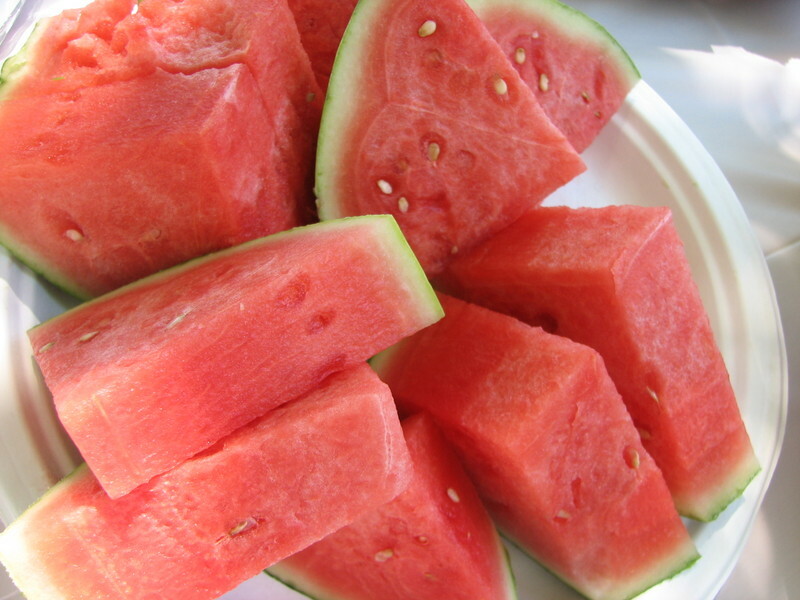 Cut up some juicy watermelon into little chunks and squeeze fresh limes all over them. For a stronger flavor, you can zest the limes as well. It’s a refreshing, delicious and surprisingly nutritious way to end a meal (or begin one). For specifics, see this recipe in the San Francisco Gate.